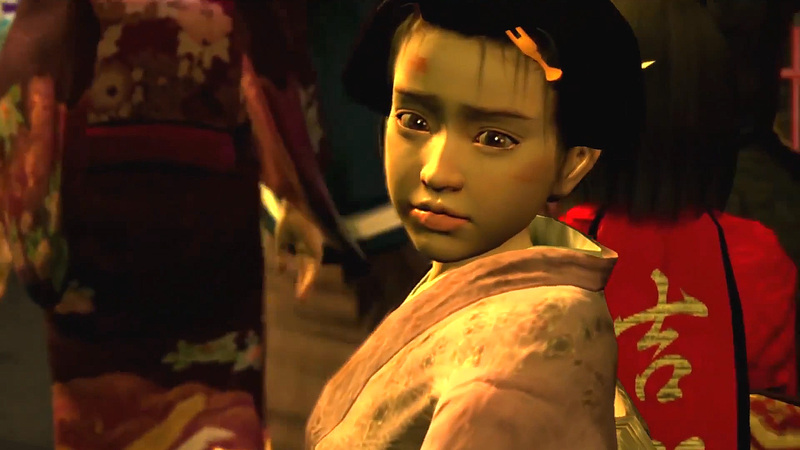 "A lone girl appears in the Gion 祇園 district, carrying a sword, and asks for Kiryuu Kazumanosuke 桐生一馬之介. Kiryuu is actually Miyamoto Musashi 宮本武蔵, gone into hiding. The arrival of such a strange guest does interest Musashi at first, but he can see no profit from her appearance, and turns to go away. When he sees her sword, however, all of that changes. It's a wakazashi with a bell tied around its guard--the same kind of bell in the same fashion as the ones Musashi had received earlier from Ukiyo 浮世, a lady whom he failed to protect. An old man saw Musashi holding the slain Ukiyo and immediately assumed he was responsible. Later, Haruka would find out from this man that the sword she was holding belonged to Miyamoto Musashi. So, she sells her body in Gion to become a kamuro (a sort of apprentice) at the ageya (an old style of brothel in pleasure districts), Tsuruya. This way, she can have some money to pay Musashi, known to her as Kiryuu, and hire him to avenge her family's death. She believes that her family was killed by none other than Miyamoto Musashi, Kiryuu's true identity, because of the sword. It turns out that her family was actually killed by Marume Nagayoshi 丸目長恵 in one of the secret missions Nankoubou Tenkai 南光坊天海 and Sasaki Kojirou 佐々木小次郎 were carrying out in Japan. Years earlier, the rightful heir to the Tokugawa shogunate's thrown had fallen out with his father. So, Tenkai had him killed, so that he could remain the chief advisor to Tokugawa's other son, Tokugawa Hidetada 徳川秀忠. Unfortunately, this left his daughter, Haruka, to still be around to (theoretically) dispute the lineage. So, Tenkai orders her death and the deaths of her adoptive family. When Marume confronts her to kill her, she is unable to see his face because he is wearing a traveler's hat, with a very long brim, obscuring him from her sight. She grabs his wakizashi and flees, but Marume stops troops from pursuing her. Back in present day Gion, she has sold her body for 1 ryou. 1 ryou was really a lot of money in those days--about the same as a year's salary for much of the realm. It's not a lot of money to sell your daughter for, and the characters talk about it as though it was an extremely low amount. However, for this fee, Kiryuu agrees to set out and find the man who killed Haruka's family, bringing them to justice (in other words, killing them). Of course, this sets up a situation in which Haruka will discover things about Kiryuu's past that will lead her to lose faith in him. He is, after all, the "real" Miyamoto Musashi. Musashi is told by Marume in a surprise meeting at the Houzouin part of the Koufuku Temple that he must protect Haruka at all costs. Earlier, there was an event where Haruka was grabbed by a seemingly-licentious official at the Tsuruya ageya and dragged around by the arm. It is later revealed that he went there with the intention of kidnapping the girl. Later, it will be revealed by none other than the man who instigated the bakufu government that would last for 268 years, Tokugawa Ieyasu, himself, that Haruka was his grand-daughter, and daughter of his estranged son, Yuuki Hideyasu 結城秀康. On one hand, this does mean that Musashi killed Haruka's family. Her father did actually die by his hand at a secret mission during the Battle at Sekigahara. However, it was really Tenkai who was behind it all. Tenkai had manipulated the scenes--and the Tokugawa themselves--in order to create a new world in which he was in control. Somehow, he gets his hands on Haruka near the end of the game, and is holding her there to further manipulate the Tokugawa. So, Musashi is pitted against the most powerful adversary of the time by fate, and tells Haruka that she bought him a new life with that one ryou she paid him at the pleasure districts. Of course, historically, this doesn't really seem to add up. A daughter in the lineage of any ruler just doesn't seem to mean too much. In old Japan, a young man would typically be adopted into a household in preparation of taking their daughter's hand, so, in that light, she may actually hold the key to the succession of power, but it's very unlikely. Just like in the West's Medieval times, there would be a lot of concern over the sons of a ruler, not over the daughters. Another reason is that Yuuki Hideyasu was already officially out of the Tokugawa bloodline, having been given over to the Yuuki house. Although the idea of him later demanding the seat of power be handed to him is, of course, not entirely unheard of, it would probably have been very unlikely for him to have found support as this practice of adoption was already fairly common. Even if he had been killed, which it looks like he was just two years after his brother succeeded him, Hideyasu's descendants would almost assuredly have been considered Yuuki and not Tokugawa. If Ieyasu's love for Haruka is what Tenkai is using as leverage, even that doesn't make much sense since he already has the current kubou under his thumb. Munenori hints that Tenkai's hold on Hidetada cannot last long because Hidetada is older now, but if that is the case, why doesn't Hidetada order troops to go against Tenkai? Overall, it's a pretty weak case."